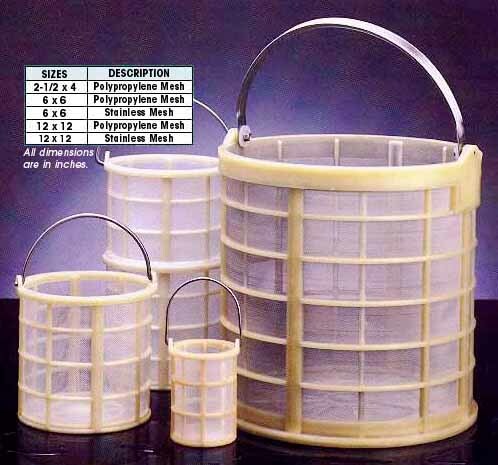 Baskets for Cleaning, Rinsing, Drying, Batch-Processing, etc. Sterling offers a variety of unique parts baskets for many applications. Handling, processing and finishing operations often require lightweight, fast draining parts baskets and, at Sterling, these are a specialty. From nuts and bolts to delicate micro-electronic components, Sterling makes a basket for your part loads. In stock baskets are available in all sizes shown. Frames are molded from glass-filled polypropylene and superior quality mesh is offered in stainless steel or polypropylene materials. Specifications subject to change. Contact Sterling for details.